Beginnen Sie mit einer Hotelabholung um 7.30 Uhr oder 8.30 Uhr, je nach Jahreszeit. Wenn Sie die Sehenswürdigkeiten von Siena in die Ferne rutschen, werden Sie feststellen, dass sich die Landschaft in die hügeligen Hügel der Toskana verwandelt. 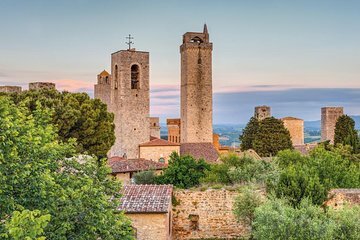 Ihr erster Halt in der Region ist die beliebte Hügelstadt San Gimignano, die zum UNESCO-Weltkulturerbe zählt. Genießen Sie hier Freizeit, um durch die Straßen des historischen Zentrums zu spazieren und die mittelalterliche Architektur, Türme, Plätze und Kunsthandwerksläden zu bestaunen. In San Gimignano wird der bekannte Vernaccia-Wein produziert, und in den Straßen finden Sie zahlreiche Enoteche (Weinhandlungen). Als nächstes fahren Sie in die historische Festungsstadt Monteriggioni. Die Hügelstadt ist von intakten mittelalterlichen Mauern umgeben, die aus dem 12. Jahrhundert erhalten wurden. Hören Sie, wie Dante die Türme der Wände mit den Riesen des Infernos in seiner Göttlichen Komödie verglichen hat, als Sie die Stadt betreten, und machen Sie sich dann auf den Weg zu einem Weingut zum Mittagessen. Genießen Sie eine leichte Mahlzeit mit Käse und Salami aus der Region sowie Chianti-Wein. Wenn Ihr Appetit gestillt ist, reisen Sie in die Toskana im Val d'Orcia, wo das Winzerdorf Montalcino auf Sie wartet. Probieren Sie den geschätzten Wein Brunello di Montalcino und erfahren Sie mehr über die Traditionen der Weinherstellung in der Stadt. Entspannen Sie sich auf der Rückreise nach Siena und beenden Sie Ihren Tagesausflug mit einem Hotelrückgabe. First off our guide was amazing, she picked us up from the hotel right on time. She was very knowledgeable and fun. She gave us time to walk around. The wine tasting was fantastic! The wineries were beautiful. It is easy rides everywhere. You get to see a lot. If you like wine, this is a great tour. Transportation was 1,5 hours late and we arrive San Gimignano 2 hours late meaning very little time in San G. I called previous day to the local office and went through that our pick up point Piazza del Mercato Bus stop is easy to come. When we noticed that pick is not going to be on time, I called three times to the local office and they every time promised to call me back and tell the situation. They never called back, which is very unprofessional in this kind of situation. W didn't get any kind of explanation, only sorry and during the trip there was not a single word of guidance. Also because of late arrival to the first wine tasting and lunch, we had to wait in hot sunshine for our turn to get in. This kind of trips are for us once in a lifetime experiences and this we definately remember but not for positive things. We have not received any kind of explanations and/or compensation from the local organizer. Enjoyed the trip through the countryside. Lunch and wine tasting very good. The towns themselves pretty touristy. Could skip the small one in Chianti altogether. Loved the guide. This a Great way to spend the day visiting 2 wineries and visiting beautiful Tuscany towns. Best day trip of our time in Tuscany. We had a fabulous day out with the wonderful Marco as our driver and guide. Our small group comprised five people and although the weather was disastrous heavy rain, thunder and lightning in the morning, Marco gave us options which allowed us to make the most of our day. San Gimignano was brilliant - but we were too early for the Cathedral and the museum. The wine tastings were superb, we had a lot of fun and learned a great deal about Chianti and the history of the area's wine making. Montalcino was also beautiful although most of the shops and cafés were closed due to it being a Sunday. We chose a tour at the end of the season so we were quite prepared for this. We would highly recommend the tour to anyone wanting to get a feel for the real Tuscany! Perfect, relaxed day with generous wine tasting at two wineries. Very good guide. I think one wine tasting visit would have been enough for us. But, having said that still got to see some beautiful Tuscan towns and countryside. We would recommend it. Adel was an interesting tour guide. A sense of humour and a bit of history. Just wright. This was a really good tour with a good tour group. To have free time in San Gimignano was great and the winery visit, tasting and lunch was superb. My only suggestion is to skip the Montalcino tasting as the wines were far inferior and detracted from the earlier experience.